The problem with these polls is that you can only pick one option. I think Asaka was Rum, but I also think Rum is another character we've seen in the course of the manga, and I still think that there's a good chance that Rumi is Rum as well. So I don't know which one to mark since I can't put all three. On another note, I found it interesting that anime episode 864 adapted it not only to say that a woman was seen with the mirror, but to straight up say that Asaka was a woman. That adds to my suspicion that Wakasa Rumi=Asaka=Rum. I can't wait to see more adaptations of story cases to see what else they might give away that wasn't so clear in the manga. That was pretty clear in the manga though... the difference being that they subbed it as a if it was something he found out, rather than something he believed(I guess I see what you mean). Rumi being Rum is like Subaru being Bourbon. I kind of have to agree with MeitanteixX. I remember people thinking that Okiya was Bourbon, but it turned out to be Akai, and there is so little concrete info on Rum that every suspect is a possible red herring right now, so I am not really going to say. Could Rumi be Rum? Yes, she could, since there are some hints that she might be involved with the Koji case, but that would just make things as boring as The Mysterious Affair at Styles. I just spotted an anomaly(?) in chapter 899. Just when Shukichi gets to leave the Shogi finals to save Yumi, Chikara looks up at him. Which is pretty obvious but what is more baffling is the way he's depicted as looking up to Shukichi. Gosho seems to give the readers an exclusive direct/face to face shot of Shukichi,while putting the supposed manga-reader in an oblique place just behind Chikara. 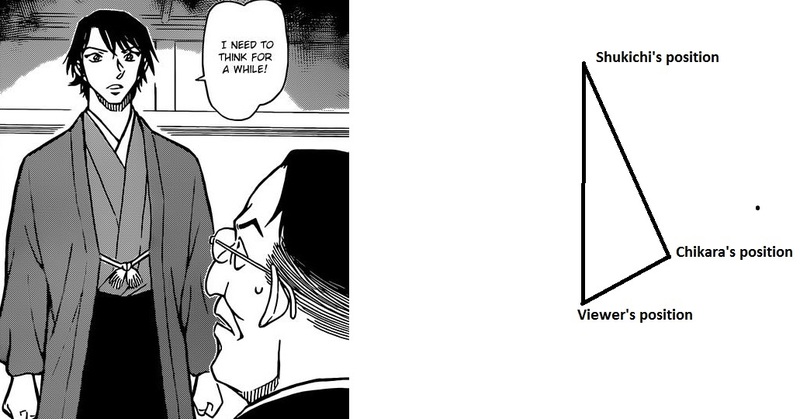 So from the reader's perspective Chikara should look a bit oblique(as mentioned in my diagram), but the obliquity wouldn't entail the user to see his eyeball as it would be focused on Shukichi. The real issue here is that Chikara's face should exactly face Shukichi as he's looking directly at him. From viewer's perspective Chikara looks more tilted towards his(Chikara's) left. His left eyeball should be more close to his nose bridge than it's in reality. As if Chikara tilted his head a little to his left to get a fuller view of Shukichi, and the positioning of his left eyeball also is somewhat odd. It looks rather to be focused on the left than on Shukichi. Generally our line of vision is exactly perpendicular to the imagined Vertical plane which just touches the back of our head when we're moving our head to focus on something. In the case of Chikara's left eyeball the line of vision is not locked on Shukichi. Chikara can very well have a Prosthetic eye. I spent a lot of time counting the directions characters' heads are facing for a personal project. This slight turning of the face is normal for Gosho and other western and eastern comics alike because it looks better and allows the reader to see more expressions instead of the back of people's heads. It doesn't mean anything unusual and if you look on other pages you will see the same oblique turning. I know it, but can't ignore if this happens to one of the Rum suspects, for obvious reasons. Can be totally normal thing, but can also be a clue if Chikara is Rum. 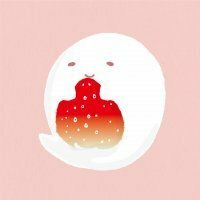 So I just shared what I had spotted, might just be another over alalyzing of the stuff. Just reminding you guys that i called it 2 years ago that Koumei is getting involved with the Rum case, and i still Believe that Koumei IS Rum and he has something to do witht he murder of Scotch. I also belive that Koumei IS scotch's brother and Kuroda is actually Akai's father whose physical appearance changed in the last 17 years. funny reminder.... because as far we are concerned, Koumei is not automatically getting involved with the "Rum case" just by being Scotch's brother. He is the only Rum candidate that still hasn't met Haibara to this day in any case. Him being Scotch's brother involves him automatically with the BO ,which means he is not one of those filler characters with a trivial side story like many others. Wakita Kanenori, Katsumata Chikara, Iori Muga... he is not the only suspect. Not sure I would classify him as effeminate. What exactly suggests that? Not necessarily. Gosho could simply make him related to Hiromitsu for a nice side story, and that's that. Sure, you can say Koumei now has a tie to the BO through Scotch, but being involved with them is a completely different leap that Gosho hasn't even introduced or hinted at. In other words... we can't tell yet with the info that we have that he is 100% getting involved in the BO plot. but..later in the file or another file Bourbon was on the phone with Kuroda and was not nervous whatsoever my guess Is Kuroda is part of the NPA with Bourbon and Kuroda is his boss or something like That..Well that's my guess it kind of makes sense! last Chapter 1027-1031-She is Rum! I'm very sure that Wakasa Rumi is Rum,Now i will tell why. First I think that Rum is normally a Male(A Old men). Then he became a Woman.This shows how easy someone can called a Old men,a strongly man and a Woman. In the last Chapter it was Really important to look at Wakita.He and Bourbon thought about something and Wakita said 9 tailed Fox!read about it.Its a Woman,who seduce someone into bad things or something like that.But more important is the Start of the Chapter.Conan and the others playing Cards.He holds the Heart 4 and the Joker Card!!! Joker means trickster its also a personality which is really crazy and its easy to jump into another person or play another role of personality.Gosho tries to make us insecure. Now i have more about Wakita to tell! And yes everyone of his Childs has something inherited of him. Kanenori Wakita is Tsutomu Akai!He also finds out that Shuichi lives in Kudos Villa this is the Reason why he wants to deliever sushi there although no one called him.He and Hyoe Kuroda are related.They have the same phones and Wakita must know that Akai lives in the Villa from Kuroda,because he knowes it from Bourbon.Maybe Bourbon should not know that Wakita is tsutomu Akai and Kuroda wants Bourbon only to find more about special things.I have i idea who could be Kuroda but for now it should be okay. So, since "asaca rum" has been revealed to mean "karasuma", doesn't that mean Wakasa Rumi's obviously suspicious name becomes irrelevant? Koumei's very pointed comments about "time is money" comes across as red herring too. Anyone ever mentioned the possibility that Kuroda is both Akai Tsutomu and Rum? Someone who is originally trying to spy into the org, but ended up a turncoat and became loyal to the org instead.